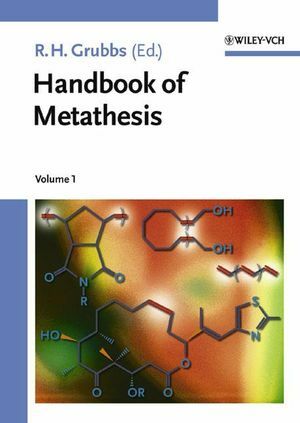 There is probably no name more closely linked to metathesis than that of Robert H. Grubbs of the California Institute of Technology. His pioneering work has led to the success of this important and fascinating reaction and in this comprehensive three-volume work he presents all its important aspects. The Role of the "Tebbe Complex" in Olefin Metathesis. The Discovery and Development of High Oxidation State Mo and W Imido Alkylidene Complexes for Alkene Metathesis. From ill-defined to well-defined W alkylidene complexes. Discovery of Well-defined Ruthenium Olefin Metathesis Catalysts. Synthesis of Ruthenium Carbene Complexes. ynthesis of Rhodium and Ruthenium Carbene Complexes with a 16-Electron Count. Mechanism of Ruthenium-Catalyzed Olefin Metathesis Reactions. Intrinsic Reactivity of Ruthenium Carbenes. The Olefin Metathesis Reaction in Complex Molecule Construction. Applications of Ring Closing Metathesis to Alkaloid Synthesis. Radicicol and the Epothilones: Total Synthesis of Novel Anti Cancer Agents Using Ring Closing Metathesis. The Use of Olefin Metathesis in Combinatorial Chemistry: Supported and Chromatography-Free Syntheses. Metal-Catalyzed Olefin Metathesis in Metal Coordination Spheres. Commercial Applications of Ruthenium Metathesis Processes. Living Ring-Opening Olefin Metathesis Polymerization. Syntheses and Applications of Bioactive Polymers Generated by the Ring-Opening Metathesis Polymerization (ROMP). Metathesis Polymerization: A Versatile Tool for the Synthesis of Surface-Functionalized Supports and Monolithic Materials. Telechelic Polymers from Olefin Metathesis Methodologies. Acyclic Diyne Metathesis Utilizing in Situ Transition Metal Catalysts: An Efficient Access to Alkyne-Bridged Polymers.